Docparser was built for the modern cloud stack and offers a variety of cloud integrations. Connecting Docparser to other cloud applications allows you to automate your entire document parsing workflow. 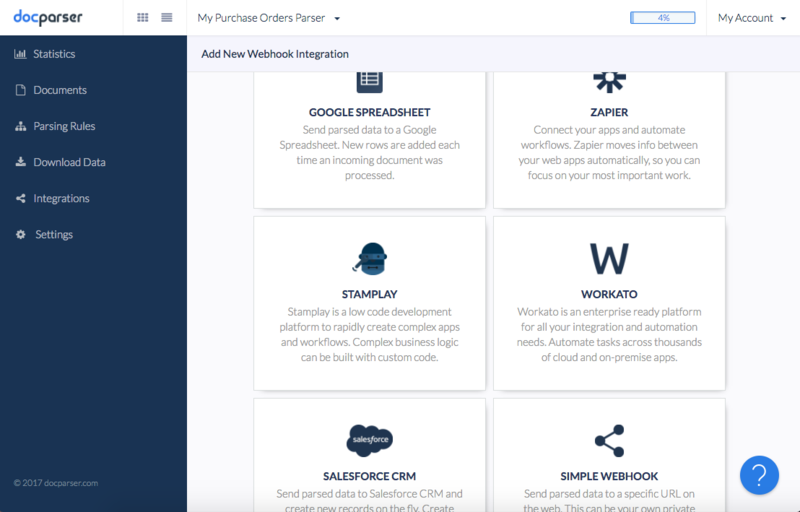 Docparser comes with built-in integrations such as Google Sheets and supports popular cloud integration platforms (Zapier, Workato, Stamplay). If you want to dive deep into how to set up cloud integrations, you can find more articles in our knowledge base. In case you are a developer, you should also check out our REST API which allows you to import documents and obtain the parsed data with your favorite programming language. Parsed data can also be sent to your own API in real-time by using our powerful webhook features.